bar not a pub. dont let that put you off. 3 pumps, harveys and 2 dark star. bistro next door(cant say anything about the food, never eaten there!) never had a bad pint in there. worth a visit. As a lover of good food Quench is by far THE best bar in Burgess Hill for GOOD, FRESH,IMAGINITIVE home cooking, the new re fit has done wonders for the bar. I am not a drinker of real ales but drink with people who are and they tell me the ales are excelent.If you have not visited do give it a try. 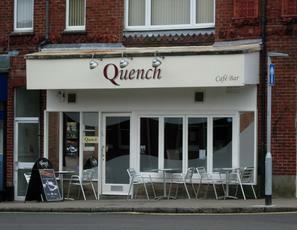 My favourite bar/restaurant in Burgess Hill. Fantastic staff, delicious menu and lovely atmosphere. Menu ranges from light bites to full dishes, great cocktail menu plus some scrummy shots!! Making a serious attempt to sell real ale (has occasional mini beer festivals) and trying a variety of things to make the bar a success in a town where pubs rule the roost. Always worth a visit but I tend not to stay there all night as its either packed, or I'm heading elsewhere. Good effort - keep it up!